Searching for ways to better understand the fixed income space or looking for actionable ideals in this asset class? Bespoke’s Fixed Income Weekly provides an update on rates and credit every Wednesday. We start off with a fresh piece of analysis driven by what’s in the headlines or driving the market in a given week. 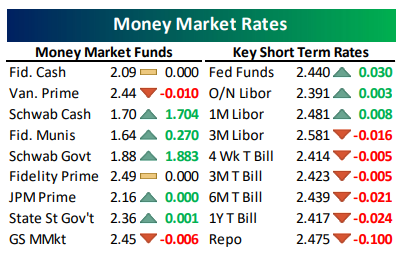 We then provide charts of how US Treasury futures and rates are trading, before moving on to a summary of recent fixed income ETF performance, short-term interest rates including money market funds, and a trade idea. We summarize changes and recent developments for a variety of yield curves (UST, bund, Eurodollar, US breakeven inflation and Bespoke’s Global Yield Curve) before finishing with a review of recent UST yield curve changes, spread changes for major credit products and international bonds, and 1 year return profiles for a cross section of the fixed income world. In this week’s report we compare returns for equally-weighted versus market cap-weighted EM sovereign bond exposure. Our Fixed Income Weekly helps investors stay on top of fixed income markets and gain new perspective on the developments in interest rates. You can sign up for a Bespoke research trial below to see this week’s report and everything else Bespoke publishes free for the next two weeks! Click here and start a 14-day free trial to Bespoke Institutional to see our newest Fixed Income Weekly now! 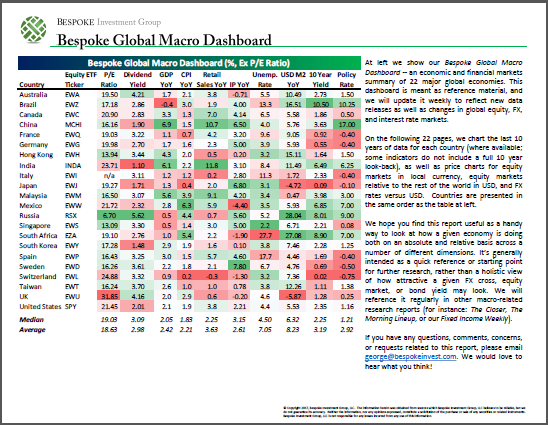 Bespoke’s Global Macro Dashboard is a high-level summary of 22 major economies from around the world. For each country, we provide charts of local equity market prices, relative performance versus global equities, price to earnings ratios, dividend yields, economic growth, unemployment, retail sales and industrial production growth, inflation, money supply, spot FX performance versus the dollar, policy rate, and ten year local government bond yield interest rates. The report is intended as a tool for both reference and idea generation. It’s clients’ first stop for basic background info on how a given economy is performing, and what issues are driving the narrative for that economy. The dashboard helps you get up to speed on and keep track of the basics for the most important economies around the world, informing starting points for further research and risk management. It’s published weekly every Wednesday at the Bespoke Institutional membership level. You can access our Global Macro Dashboard by starting a 14-day free trial to Bespoke Institutional now! In another busy morning for earnings, we have already seen more than 50 companies report, and like yesterday, the EPS beat rate among these companies has been very strong at 67%. Unlike yesterday, though, the revenue beat rate hasn’t been nearly as strong as just under half of the companies reporting so far have managed to post better than expected revenues. With the S&P 500 closing just above its former record high yesterday, one would think the last seven months have been nothing more than running on a treadmill for the stock market. A look deeper, though, shows that there has been no shortage of big winners (and losers) in terms of industries. 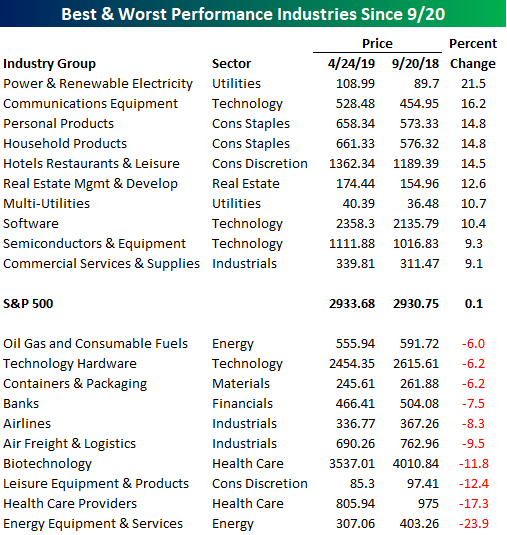 The table below shows the ten best and worst performing S&P 500 industries since the S&P 500’s 2018 closing high on 9/20. Eight of the biggest winners are all up over 10%, including one – Power & Renewable Electricity- which is up over 20%. Who would have thought that an industry from the Utilities sector would have led the market? Outside of Utilities, Technology has been a big contributor to the market’s strength with three industries in the top ten (Communications Equipment, Software, and Semis). Another surprising sector with representation on the list is Consumer Staples. Both the Personal Products and Household Products industries are up 14.8% since the S&P 500’s 2018 high. On the downside, Energy has been a drag as Energy Equipment and Services has dropped over 23% since 9/20 while Oil, Gas & Fuels is down 6%. One would think that with oil prices so high, that this group would have done better, but no such luck. Two groups that have felt the pinch from higher energy prices (and other issues like the 737) are Airlines and Air Freight. Both of these industries from the Industrials sector are down close to 10%. Looking for deeper insight on markets? In tonight’s Closer sent to Bespoke Institutional clients, as the S&P 500 reached an all-time high rising over 80 bps today, we begin tonight’s Closer by evaluating the forward returns for the past ten times the index rose to all-time highs in a similar fashion. We also make note of improved correlation while the dollar has also improved. 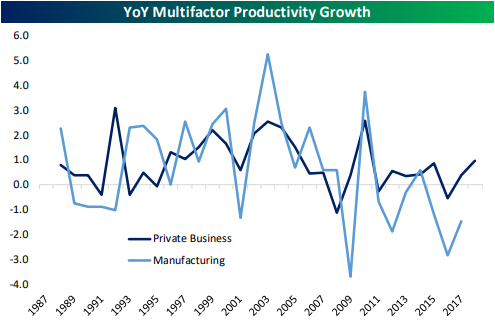 Pivoting to economic data, we look at Multifactor Productivity for 2017 which was released today. We also update out Five Fed Manufacturing Composite with the addition of the Richmond Fed’s input. We finish with a recap of New Home Sales. B.I.G. Tips – New Highs. Now What? That was fast! When it comes to market recoveries from a correction, they don’t get much more v-shaped than the last seven months. 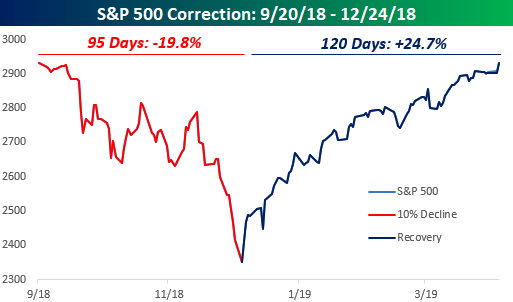 After falling just short of a 20% decline (on a closing basis) in the span of 95 calendar days from 9/20/18 to 12/24/18, the S&P 500 has charged back and is on the cusp of closing above its record closing high from 9/20. If it closes above that level today, it will have rallied 24.7% in the span of just 120 days. Present company included, there aren’t that many people who back in December would have anticipated a record closing high in the S&P 500 before April 30th! In our just-released B.I.G. Tips report, we took a look at prior corrections from all-time highs in the post-WWII period based on their magnitude and duration as well as how long it took them to reclaim their prior highs. We then compared those periods to the current one to find which ones had the most in common. To gain access to the full report, please start a two-week free trial to our Bespoke Premium package now. Here’s a breakdown of the products you’ll receive. Our “Death By Amazon” index was created many years ago to provide investors with a list of retailers we view as vulnerable to competition from e-commerce. In 2016, we also created our “Amazon Survivors” index which is made up of companies that look more capable of dealing with the threat from online shopping. To see how the two indices have been performing lately and view the full list of stocks that make up the indices, please read our newest report on the subject available to Bespoke Premium and Bespoke Institutional members. 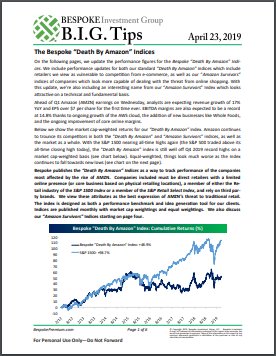 To unlock our “Death By Amazon” and “Amazon Survivors” indices, login or start a two-week free trial to either Bespoke Premium or Bespoke Institutional. 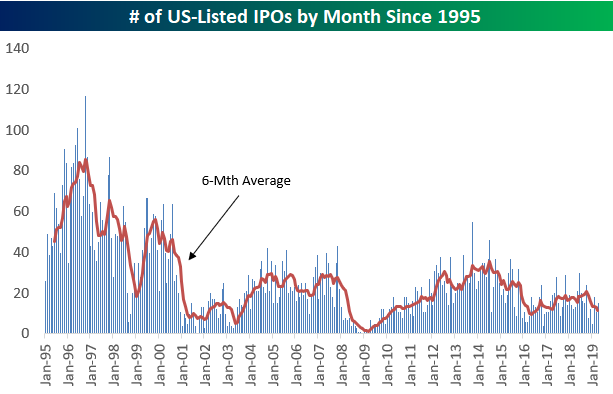 Recent initial public offerings like Lyft (LYFT), Zoom (ZM), and Pinterest (PINS) have sparked a lot of interest lately, so below is a chart showing the number of US-listed IPOs by month since 1995. As you can see, the monthly numbers have actually been trending lower since peaking for the current bull market in mid-2014. 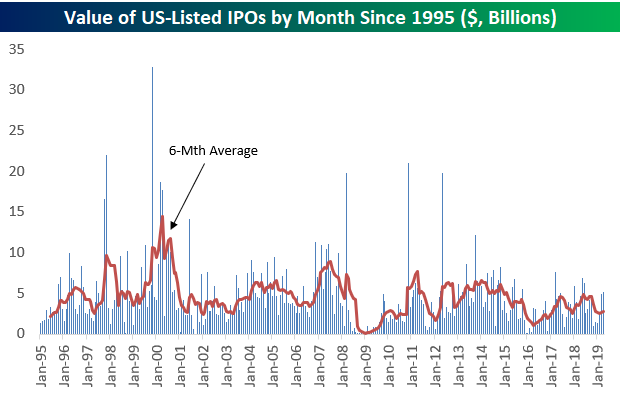 And the late 1990s, when we were seeing 100+ IPOs in some months, is an environment we might never again see in our lifetimes again. 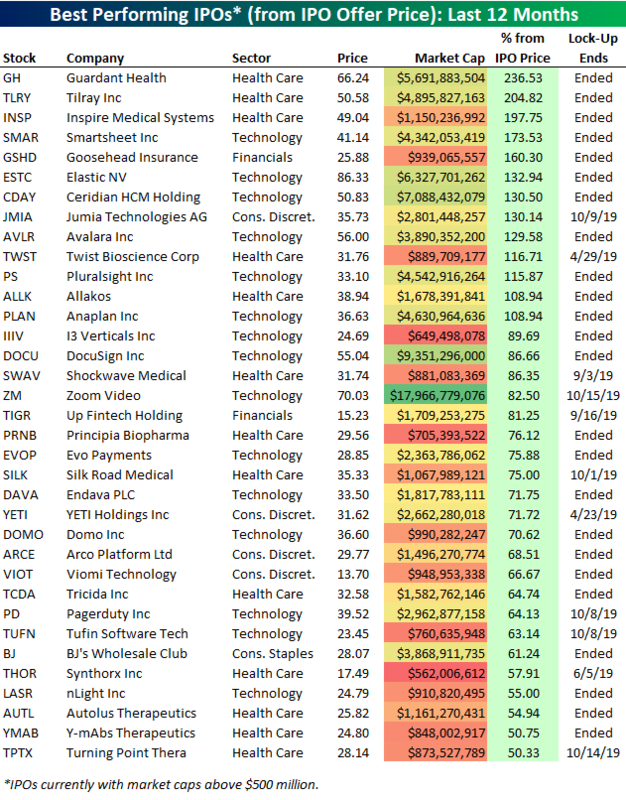 We ran a screen of companies that went public within the last 12 months to find the ones that are up the most from their IPO price. Below is a list of the 35 best performers. Two recent Health Care IPOs are up more than 200% from their IPO price — Guardant Health (GH) and Tilray (TLRY). Inspire Medical (INSP) — another Health Care stock — ranks 3rd best with a gain of 197.75%. Zoom Video (ZM) is the largest stock on the list with a market cap of $17.97 billion. ZM just went public last Thursday and is already up 82.5% from its IPO price! Note that Zoom’s lock-up expiry (the date that shareholders within the company can sell shares) isn’t until October 15th. Other notables on the list of biggest IPO winners include digital signature company DocuSign (DOCU), sales tax software company Avalara (AVLR), and the popular cooler and mug company Yeti Holdings (YETI). Yeti’s lock-up actually ends today, so it will be interesting to see how the stock trades near term. 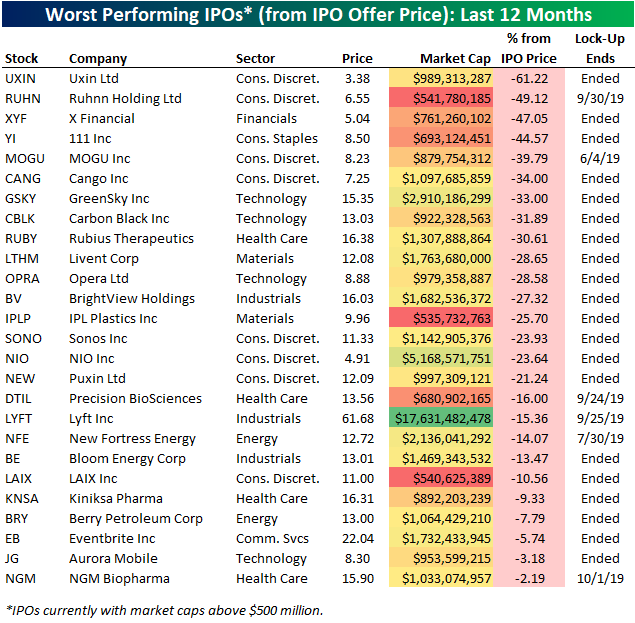 Ride-sharing app Lyft Inc. (LYFT) is by far the biggest standout on the list of IPO losers. Since the company went public at the end of March, its shares are down 15.36%. With a lock-up date of September 25th, corporate insiders have a long time to watch these shares rise and fall without being able to exit. Start a two-week free trial to Bespoke Premium to unlock all that Bespoke’s research has to offer! With a late-morning surge in equity prices pushing the S&P 500 above its all-time closing high from 9/20, we wanted to see where individual stocks in the index stand relative to their own 52-week highs. The chart below shows the distance (in percentage terms) that every stock in the S&P 500 is trading from its 52-week high. Overall, the S&P 500 is now within 1% of its 52-week high. 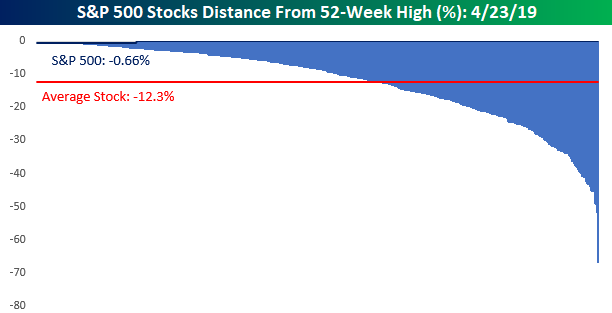 For individual stocks, though, the average distance from their respective 52-week highs is actually just over 12%. Also, in case you were wondering, the blue bar all the way to the right represents Nektar Therapeutics (NKTR) which is down 67% from its 52-week high! There may always be a bull market somewhere, but as NKTR proves, there always a bear market somewhere too. With the S&P 500 knocking on the door to new all-time highs, we’re going to also want to see an expansion in the number of stocks hitting new highs. So in order to see which sectors pose the best chance of expanding the new high list, the table below breaks down each sector within the S&P 500 and shows how far stocks in each one are, on average, trading down from their respective 52-week highs as well as what percentage of stocks in the sector are trading within 5% of a 52-week high. The Utilities sector tops the list with the average stock in the sector down just 4.2% from its 52-week high and 79% of stocks in the sector trading within 5% of a new high. After Utilities, just two other sectors have more than half of their components trading within 5% of a new high (Technology and Industrials). Given the sector’s relatively low volatility, it’s not too surprising that Utilities top the list. The fact that more than half of stocks in the Technology and Industrials sectors are within 5% of their 52-week highs, though, is impressive. These are two sectors to watch as the S&P 500 attempts to take out its highs. At the other end of the table, Energy is still trying to recover from its weakness last year as the average stock in the sector is still down over 20% from its 52-week high and barely 10% of stocks in the sector are within 5% of a new high. Because of its relatively low weight in the S&P 500, Energy hasn’t acted as much of a drag. Health Care, though, is a different story. 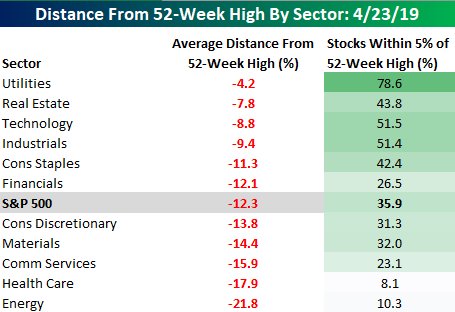 After the recent carnage in the sector, the average Health Care stock is down nearly 18% from its 52-week high, and less than 10% of stocks in the sector are within 5% of a new high. With a weighting of over 13% in the S&P 500 and 61 stocks in the sector, it is going to be difficult to get any meaningful expansion in new highs with Health Care stuck in the infirmary. Start a two-week free trial to Bespoke Premium to unlock all that Bespoke’s research has to offer! This morning, Lockheed-Martin (LMT) smashed earnings expectations, reporting $5.99 EPS for Q1 versus $4.34 expected. The beat was driven by sales of $14.3bn, exceeding analyst estimates of $12.6bn, and also came with a dramatic upgrade to guidance for all financial metrics this fiscal year. 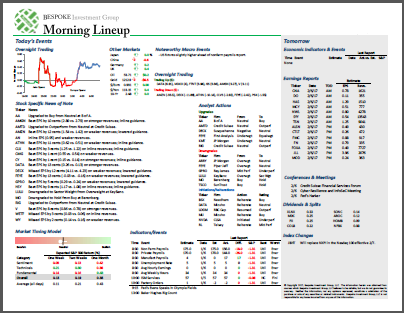 The triple play from LMT joined strong reports from Textron (TXT) and United Technologies (UTX). Together, these three companies are seeing combined revenues grow at a staggering 18.7% YoY, the fastest since defense spending’s huge ramp up following the 9/11 attacks and the invasions of Afghanistan and Iraq. 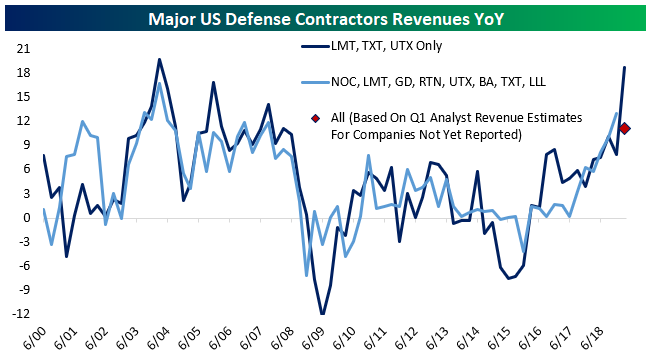 Among other defense contractors, analysts are projecting revenue numbers for Q1 that would indicate a significantly lower revenue growth number, but if the results from LMT, TXT, and UTX are any indication, those forecasts are going to be handily beaten. So which of the other defense contractors currently look the most attractive? Continue reading this Chart of the Day by starting a two-week free trial to any of our research membership levels. With markets around the world all open following a holiday on Monday for many, the mood is mixed although US futures are right near their highs of the morning. The catalyst in the US is solid earnings reports. Of the nearly 50 names that have reported so far this morning, two-thirds have exceeded EPS forecasts. More impressive, however, is the fact that two-thirds of those companies reporting have also exceeded top-line revenue estimates. It’s only one morning’s worth of data, but it is also the busiest day of earnings so far this reporting period. As earnings season has come to life, gold has completely flat-lined in the last few trading days. 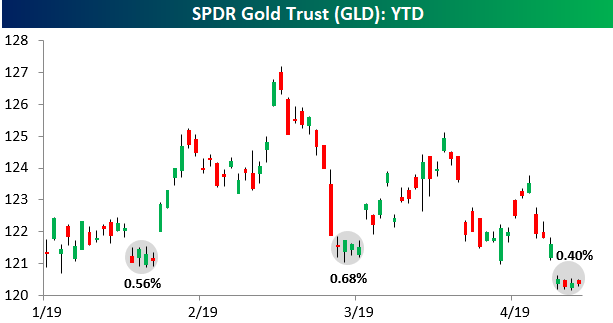 Take a look at the chart below which shows the YTD performance of the SPDR Gold Trust ETF (GLD). Over the last four trading days, the spread between the intraday high and low over that period has been just 0.40%. 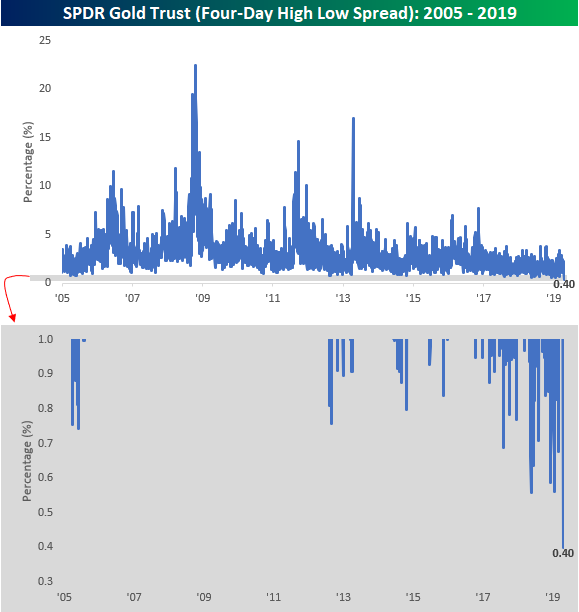 While that narrow a spread is notable enough, its the third time this year that GLD has gone into one of these four-day nap periods where the spread between the intraday high and low was less than 1%! Like the last two, will this one be another pause that refreshes? What’s even more notable about the recent narrow range for GLD is that since the ETF started trading in 2005, there has never been a four-day period where the spread between the intraday high and low over those four days has been narrower. Volatility isn’t just lower in the equity market as gold has become increasingly less volatile in recent years.